Your vacation lodging in Astoria, the oldest American city west of the Mississippi River, should be in the city’s charming historic district, and the Moose Lodge at Clementine’s Bed & Breakfast is the perfect choice for families with children, couples traveling together or larger parties desiring individual quarters in the same location. Fido will be welcome, too! 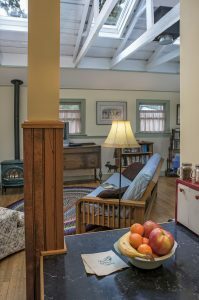 Located next door to the B&B in the heart of Astoria’s historic district, you can walk to all the downtown shops, museums, restaurants, and activities. Two separate units are available: Moose Suites and the Riverview Loft. 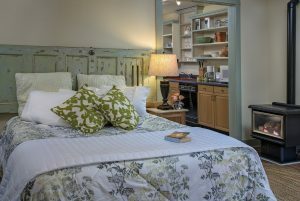 Both have living areas, well-equipped kitchens for fixing your own breakfast (and other meals if you wish), private entrances, outdoor spaces, and views of the historic Flavel House and Columbia River, plus luxury linens, bath amenities, and robes to pamper you. A two night minimum is requested; weekly rates are available. The Moose Lodge began as a private residence over 150 years ago. Perhaps the oldest surviving house in Astoria, Job Ross, the original owner, lived there from some time in the 1850s until his death in 1895, when it was inherited by his son. Like many Victorian homes on the higher ground overlooking the Columbia River, it survived the devastating fire that destroyed Astoria’s downtown waterfront in 1922. The building began a new life as the Moose Temple Lodge, home of the fraternal Loyal Order of Moose, from 1925-1948, then became a Mormon meetinghouse from 1950-1966. When Judith Markham established the B&B in 1993, she began renovating the Job Ross home next door, soon to become The Lagniappe Café. In 1998, the building was transformed into accommodations for the B&B, and now, in 2017, into vacation rentals for guests seeking longer stays and/or accommodations for larger groups. We invite you to choose our new option for extended stay accommodations in Astoria’s historic district the next time your plans include a larger group or a longer stay to enjoy more of our area’s many attractions and activities. Both units in the Moose Lodge accommodate up to six people, and free unrestricted street parking is available. We hope you will make yourselves at home! This entry was posted on Thursday, May 11th, 2017 at 11:22 am and is filed under Clementine's Bed & Breakfast News. You can follow any responses to this entry through the RSS 2.0 feed. Both comments and pings are currently closed.